There's brand new Field Research to be completed in Pokemon Go right now, for all players. 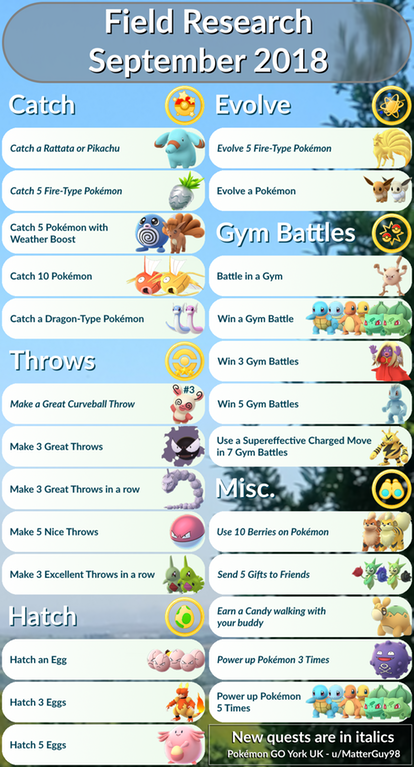 In this Pokemon Go April Field Research guide, we'll be walking you through everything you need to accomplish for the month of April 2019, including a complete look at the various Pokemon Go April Research rewards, including Lugi, Ho-Oh, Raikou, Entei, Suicune, Regice, Registeel, and Regirock. We'll also be keeping a record of all the previous Pokemon Go Research Rewards and Breakthroughs. If you need help with any other areas of Pokemon Go at all, you’ll want to head over to our full Pokemon GO guides hub. Here you can find a full beginner’s guide, tips and tricks, and much more. Contrary to popular belief, it's not just about catching pokemon in Pokemon Go. There's also a set of awesome research tasks to work through as well. Research comes in many forms, and Research Breakthroughs are a different kettle of fish entirely. To help you make head and tail of it all, we've put together this Pokemon Go Research guide. We'll explain what special research is, how to get research breakthroughs, and more! What Are Research Quests in Pokemon Go? 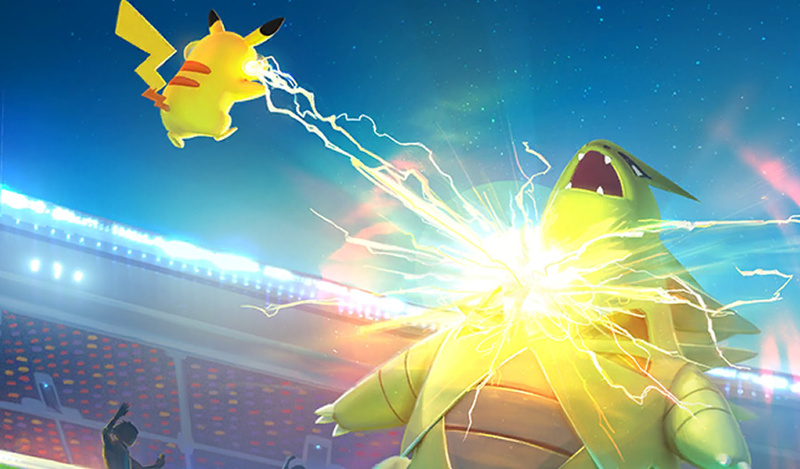 We’re now well into 2019, meaning all the April Field Research tasks are now live for all Pokemon Go players. Just below, you can see a complete roundup of all the available quests as part of the April Field Research in Pokemon Go, all thanks to the hard work of r/TheSilphRoad. In the graphic just above, you can see all the details you need on the rewards for completing Field Research for Pokemon Go in April 2019. For example, making 5 ‘Great’ curveball throws in a row will reward you with a Spinda, and battling in a Raid will get you a Shiny Drowzee. And, as always with Pokemon Go Field Research, you’ll have the opportunity to get hold of some elite Pokemon, should you complete the Research Breakthrough. You’ll have a chance of obtaining Lugia, Ho-Oh, and other Legendary Pokemon when you complete Research Breakthrough for the month of April. As a bonus, the Regi legendary Pokemon also can make an appearance – Regice, Regirock and Registeel. Research Quests give trainers individual goals to work towards while they are out catching pokemon. They are split into Field Research and Special Research, each requiring different kinds of actions to complete. They're definitely worth your while, as they grant valuable rewards upon completion. You can check your Research Quests by tapping the binoculars icon in the bottom right of the map screen. Field Research Quests are comprised of general, day to day tasks which you can complete naturally while playing Pokemon Go. They involve spinning a certain amount of PokeStops, Catching a certain number of a certain pokemon type and more. The rewards for completing Field Research Quests are varied but generally involve PokeBalls, Berries, Candy and Stardust. Make sure you check regularly to see if you can collect any Field Research rewards by tapping on the Binoculars icon and heading to the research menu.You can only have three active Field Quests at a time, though can remove them if you'd like to replace them with another. You get new Research Quests by visiting PokeStops. There are a lot of Field Research tasks to complete, so we've put together a list of some of the types you might encounter. The other type of Research Quest that you can complete is a Special Research Quest. These are story-based quests which are released into the game periodically. Currently, the Special Research Questline involves helping Prof. Willow track down Mew. It's called "A Mythical Discovery, and tasks the player with performing a series of tasks to eventually catch the mythical pokemon Mew. There are large XP boosts associated with completing these tasks, so it is definitely worth your time. There's new research to complete every month in Pokemon GO. To help you keep track of it all, we've listed all previous months below. This will help you make sure you've earned everything you can while playing Pokemon Go. Thanks to the awesome infographic embedded below, you can also see what the rewards for December are. They include a new Spinda form, Kanto starters, and even Electabuzz. You'll need to complete each task to get the associated reward, and stack them up for a chance at the Research Breakthrough. The Pokemon Go Research Quests for November were pretty cool. We've included a graphic summing up all of the Pokemon GO November Field Research Quests below. The image used is from the hard-working community over at r/TheSilphRoad. Legendary pokemon Suicune was up for grabs as part of the Pokemon Go October Field Research. To get your hands on one, you needed to earn enough Research stamps by completing research tasks in October. Once you'd earned enough, you could complete the Pokemon GO October Research Breakthrough and be faced with Suicune. 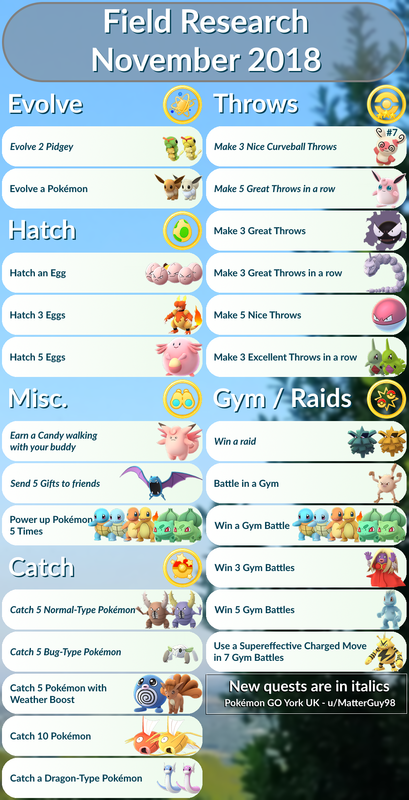 We've included a helpful infographic below, put together by LeekDuck, which shows the tasks, and their respective rewards. Turns out that the Pokemon Go Research Breakthrough will be Entei. This means that if you successfully complete a string of Research Tasks, you’ll be given the chance to catch Entei. This follows on from last month’s research breakthrough, Raikou. There's plenty to sink your teeth into this month in terms of Pokemon Go Field Research. There's good reason to as well, given how great some of the rewards for completing them are. 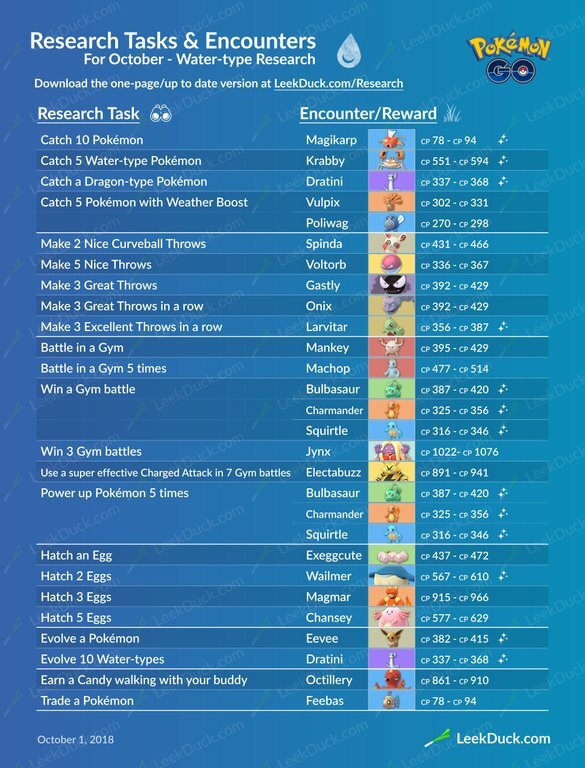 Thanks to Kryd0s over on Reddit, we now have a good idea as to the exact Pokemon Go Research Task Rewards for August 2018. It's all brilliantly showcased in the image below, so be sure to check it out for info on what you're working towards this month in terms of Pokemon Go August Research Task Rewards.